-Measures: Width: 308 cm Depth: 108 cm Height: 230 cm Weight: 2150 kg - 2 year Guarantee! - Free Shipping! The oven can be on the left side or on the right side of the Barbecue. The price keeps the same! Please contact us for further information. 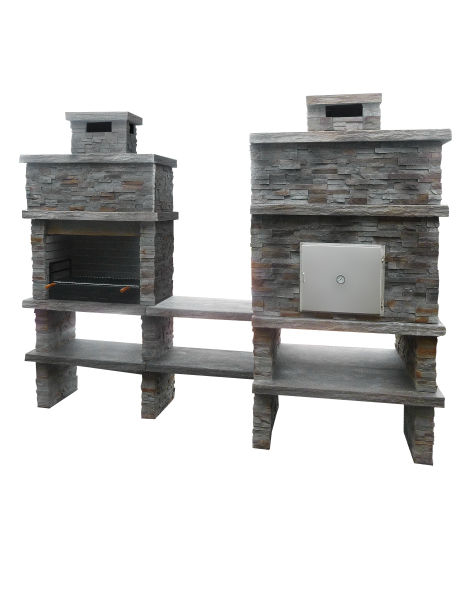 Stone Barbecue With Oven AV290F. Free shipping to England, metropolitan France*, Monaco, Belgium, Luxembourg, Italy and Spain. For other destinations please contact us. "Heat Beads best Spit Roast Recipe"
Prepare and light up the spit with the 3 bags of Heat Beads® BBQ Briquettes half an hour earlier than you plan to start cooking. Using your knife, remove any excess fat from inside the lamb. Grind half of the oregano into a small bowl, also adding the salt and black pepper. Evenly season the inside of the lamb and then skew the lamb onto the spit and secure it with the wire. Place the remaining amount of oregano on the inside of the lamb along with 10 cloves of garlic. With the remaining seasoning distribute evenly on the outside of the lamb. Place the remaining cloves of garlic into each leg of lamb and now it is ready to cook for approximately 4 hours. Mix the lemon juice with the oil and baste the lamb with the lemon and oil juice 15 minutes prior to carving the meat. Kali oreksi! !